Curcuma is one of the largest genera in the ginger family (Zingiberaceae) which comprises of more than 108 currently accepted species. 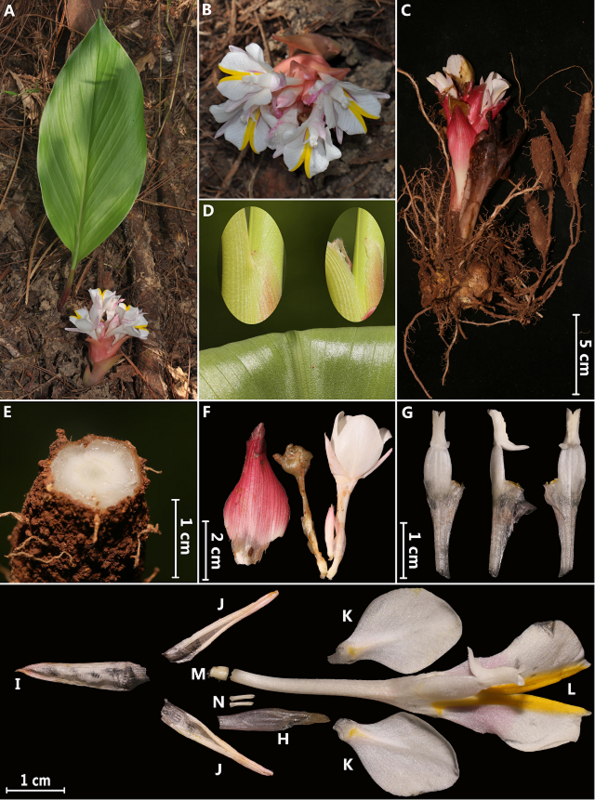 In recent years, more than 10 new Curcuma species belonging to C. subgen. Ecomata were described from Indo-Burma regions. During their floristic surveys of southern Yunnan, researchers from Xishuangbanna Tropical Botanical Garden (XTBG) collected some specimens of Curcuma. After consulting literature, examining specimens in herbaria and comparing specimens and the collections in the field, the researchers confirmed that the material is a new species. They named it as Curcuma tongii to honor Prof. TONG Shaoquan who has made great contribution to the taxonomy of Zingiberaceae in Yunnan. 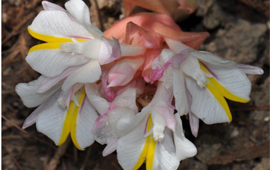 The new species Curcuma tongii has been published in Phytotaxa. Curcuma tongii is a small rhizomatous herb to 0.5 m tall. It is morphologically similar to C. singularisand other white-flowered species, and also similar to C. flaviflora and other yellow-flowered species form subgen. Ecomatae with its spike composed of a few bracts. The flowers are well-exserted from the bracts and the L-shaped anthers. purple red or dark red bands placed next to the yellow bands, and lateral staminodes pure cream white, corolla tube externally glabrous, internally densely puberulous at base, glandular hairy towards the throat. Its flowering starts by the middle of May and continues throughout June to middle of July. Its fruiting occurs in June and continues until July. Leafy shoot usually develops after flowering and the plants enter dormancy from November. C. tongii is known from southern Yunnan, with only five locations and a few hundred mature individuals known. The researchers thus assessed its conservation status as ‘Endangered’ according to the standard of IUCN.